In 1974 Paul Hill, alongside three acquaintances, was jailed for his role in the Guildford and Woolwich pub bombings – which left seven dead, and many more maimed. But he had nothing to do with it. The Guildford Four were victims of a notorious miscarriage of justice, and weren’t freed until 1989. Your Ever Loving tells Hill’s story, through the letters he sent to his mother and other family members. 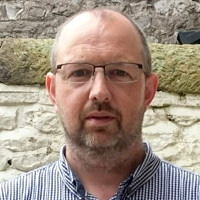 The framing device is another exchange of letters, between playwright Martin McNamara – seeking permission to use Hill’s letters – and Hill himself. Hill describes the letters as an attempt to raise the spirits of his mother, from someone struggling to maintain his own. As the letters home progress over the years, they become increasingly affecting; the mix of news about his case, family chat, music and football all conclude with the unchanging sign-off, “your ever loving”. It brings a bigger lump to the throat each time. Stefan McCusker plays Hill in naturalistic style, an ordinary man caught up in something he initially can’t quite believe is real. Later, he becomes increasingly angry and rebellious, yet determined to maintain his innocence and eventually prevail. Despite that resilience, there is a striking moment towards the end, when we get a glimpse of how the brutality of prison has changed him. James Elmes plays the rest of the world: policemen and judges, reporters and politicians, prison officers and prisoners. Until late on, they are all drawn as grotesques, effectively rendering the situation as monstrous as Hill experiences it. It's a successful performance from Elmes, which achieves what it sets out to do. But that success obscures another point this play wants to make – perhaps the most important one. Under intense pressure to get convictions, and partly enabled by the rapid introduction of new laws limiting legal protection for those arrested, the police tortured and threatened Hill until he confessed. Once that had happened, the inertia of the state took over; the establishment had no desire to admit a miscarriage of justice, the public had moved on and the narrative was set. An ordinary prison officer, for example, can't really be blamed for believing the verdict and thinking that Hill was a monster. So the wrongful conviction, and the laws which enabled it, are the true crux of this case – and fully conveying that important lesson requires more nuance than the parade of grotesques allows. Present-day terror legislation bears worrying similarities to 1974, and we're a long way through the play before that point is finally made. I'm old enough to remember the Guildford Four case, their dramatic release, and the film made about it, In the Name of the Father. I'd wondered if it was worth making a new play about this old news. But I was wrong – and the reason clicked into focus in a scene just before his release, when the football-loving Hill listens to the epic conclusion of the 1989 season. It’s not mentioned in the play, but that finale was delayed by the tragedy at Hillsborough. In the very year of the Guildford Four’s release, police malpractice in a different sphere led to another grave injustice – one which we're only uncovering now. I wondered whether, in 15 or 20 years' time, we'll be looking back on a similar event in 2017. The need to call this out will never end.